Fresh off a primary victory in West Virginia’s U.S. Senate contest, state Attorney General Patrick Morrisey took a shot at his opponent in the general election in a radio interview with Breitbart, saying Democratic Sen. Joe Manchin too often stands against President Donald Trump. Referring to Trump’s appointee to the Supreme Court, Morrisey said, “If Joe Manchin had his way, Judge (Neil) Gorsuch never would have been able to get a vote” in the Senate. Manchin’s support for Trump (or lack thereof) is likely to be a major campaign wedge for Morrisey, since Trump is more popular in West Virginia than any other state, according to state-by-state approval ratings released by Gallup in January 2018. Morrisey is right that Manchin voted against the tax bill supported by Trump and most Republicans. But he isn’t really right about Manchin’s position on Gorsuch. Here, we’ll look at Manchin’s actions on the Gorsuch nominations; we looked at his positions on Obamacare in a separate fact-check. Bottom line: When it counted, Manchin voted with Republicans to advance Gorsuch’s nomination. Morrisey’s camp pointed to three votes on April 6, 2017, during the back-and-forth over Gorsuch when Manchin voted with most Democrats. In the third vote, Manchin voted not to invoke the “nuclear option,” which is a procedural move to lower the number of votes required to advance to a final vote from 60 to a simple majority. In this case, too, Manchin voted with all Democrats and against all Republicans. However, citing only these three votes paints a misleading picture of Manchin’s actions. In the most important votes for securing Gorsuch a floor vote, Manchin sided with Gorsuch and Republicans — and he’d telegraphed it. Before the final showdown began, Manchin on March 27, 2017, became the first Democratic senator to publicly break with others in his party and say he’d side with Republicans by committing to vote in favor of proceeding to Gorsuch’s nomination. By announcing his intention to support a vote for Gorsuch a full 10 days before the final action, he sent a signal to other Democrats who still might have been deciding on what to do. And Manchin stuck to his word: On April 6, Manchin was one of only four Democrats to vote to invoke cloture and proceed to a final vote on Gorsuch’s nomination. After Senate Majority Leader Mitch McConnell, R-Ky., successfully invoked the “nuclear option,” the Senate once again voted on cloture, this time needing only a simple majority. Once again, Manchin voted to proceed to Gorsuch’s nomination on April 6, this time becoming one of only three Democrats to side with every Republican on the vote. Finally, on the actual vote on Gorsuch’s nomination on April 7, Manchin voted in favor, once again making him one of just three Democrats to back Gorsuch in the final vote. Senate specialist Gregory Koger of the University of Miami said Manchin has the better argument than Morrisey in this case. Manchin did side with Democrats on certain procedural votes during the showdown over Gorsuch. 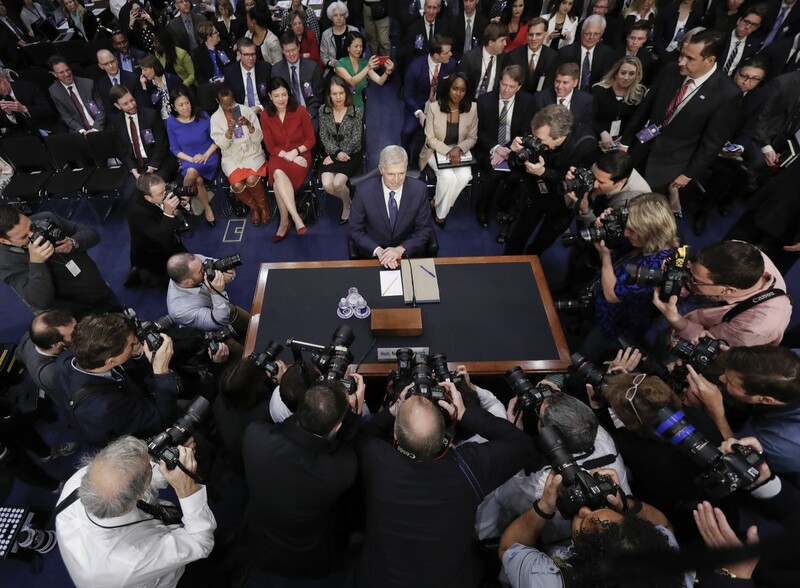 But he broadcast his support for a vote on Gorsuch early enough to persuade fence-sitters, and on the main votes, he broke ranks with his party, siding with Republicans to secure Gorsuch a vote and ultimately confirm him to the court. This article was originally published by PolitiFact. 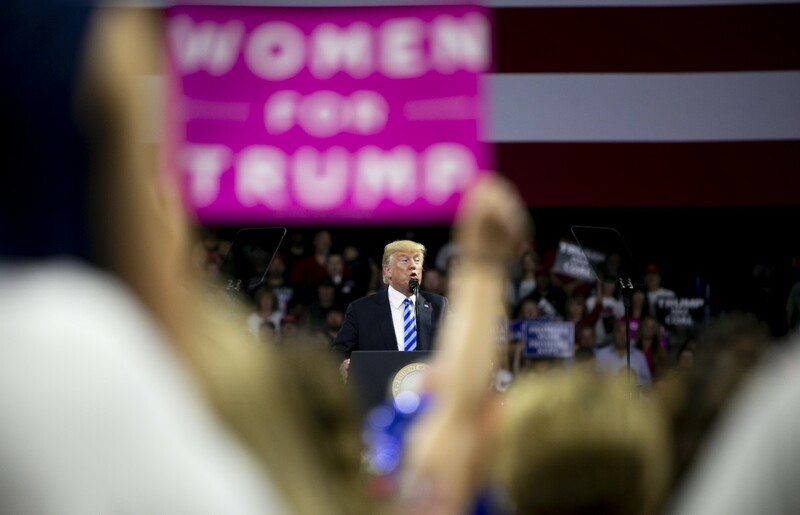 Fact-checking Donald Trump’s rally in Charleston, W.Va.
Trump’s remarks, lasting about an hour and 15 minutes, did not directly address Manafort, who was found guilty by a federal jury in Virginia, and Cohen, who pled guilty to charges in a New York courtroom. Instead, his speech covered a range of topics he frequently brings up, including his administration’s economic accomplishments, immigration and the military. Here is a rundown of some of the statements from the rally. Trump has repeatedly exaggerated the scale of U.S. Steel’s expansion. Between restarts, new mills and expansions, the steel industry has seen significant investment this year. But Trump is wrong: U.S. Steel is restarting two shuttered mills. Other companies are re-opening or building a few other mills. We have rated similar claims by Trump False. There’s no question that the tax bill Trump signed is a significant piece of legislation. But even by estimates most favorable to the president, we found the Trump tax cut is exceeded in size by other historical examples. In inflation-adjusted dollars, the recent tax bill is the fourth-largest since 1940. And as a percentage of GDP, it ranks seventh. In a tweet earlier this year, Trump used the figure 270 percent. At the rally, he used the somewhat larger figure of 300 percent, but either is a broadly reasonable estimate of Canada’s dairy tariffs, which are high by any standard. It’s worth noting, however, that the United States has recently run a sizable trade surplus with Canada in dairy products, driven by a strong business in a milk product that was unaffected by the high tariffs. Trump also glossed over the fact that the United States imposes its own trade barriers on certain American-made products. On balance, we gave Trump a Mostly True. American and Chinese government trade data support the numbers in Trump’s statement. However, China makes up a relatively small share of U.S. auto imports overall. In addition, some experts say Trump’s own trade policies have contributed to the disparity in car import tariffs. We have rated a similar claim Mostly True. Trump is correct. An appropriations bill signed by the president at the end of Marchprovided $6 billion to federal, state and local agencies to turn back the opioid crisis. According to the United States Department of Agriculture’s Food and Nutrition Service, which runs the program commonly called food stamps, there were 42.7 million Americans on food stamps when Donald Trump took office in Jan. 2017. That number had decreased to 39.3 million persons by May 2018, which is a difference of 3.4 million. So Trump is close on this statistic. Members of NATO — the North Atlantic military alliance that includes the United States and a variety of European countries — agreed to contribute at least 2 percent of their country’s GDP toward defense by 2024. However, that defense spending does not take the form of payments to the United States or the alliance as a whole. We have rated this statement False. This is not accurate. The United States pays for 22 percent of NATO’s common fund. Beyond that relatively small amount, the cost of NATO is undefined. The organization does total the defense budgets of its members, and based on that, U.S. defense spending equals about 70 percent. But the United States spends as much as it does because it is a global military power, which by and large, the European members are not. Trump has repeatedly pushed this flawed comparison even further by saying that the United States paid for as much as 90 percent of NATO’s costs. That goes beyond the exaggeration of this statistic that we’ve seen before. We have rated it Mostly False. Trump is correct. Congress gave the military a $61 billion increase from fiscal year 2017 to 2018, making the 2018 military budget total $700 billion. (That includes the Defense Department and elements of other agencies, chiefly Energy Department programs pertaining to nuclear weapons.) The 2019 spending level rises even higher, to $716 billion. Trump was off slightly on the number of casualties and the timing, but he was close to accurate. On Aug. 8, CNN reported that during the previous weekend in Chicago, 66 people were shot, 12 of them fatally, according to police. Trump has said this before, but it is misleading and something we’ve rated Mostly False. Congress appropriated $1.6 billion to replace existing border fencing and to add some new barriers. But that money was not for the border wall Trump had been promising. Even though wall prototypes were built, the Department of Homeland Security told us it does not anticipate that a single prototype will be selected as the design standard for future border wall construction. “Rather, the eight different prototypes are each anticipated to inform future border wall design standards in some capacity,” U.S. Customs and Border Protection spokesman Carlos Diaz told PolitiFact in April. Trump is still actively advocating for funds for his border wall, even though he promised Mexico would pay for it. This is partly accurate, but it doesn’t tell the whole story. As the minority party, Democrats are allowed 30 additional hours of debate after Republicans break a filibuster on a Trump nominee. Democrats have used this procedural maneuver to run down the clock and bog down the confirmation process. But laying the blame solely at the feet of Democrats oversimplifies things. Senate Republicans and the Trump White House bear responsibility, too. Because the Senate generally operates on the principle of unanimous consent, a single senator may seek to hold up an executive nominee by withholding consent. Republicans in the Senate have used more than a dozen such “holds” to extract concessions from the executive branch. For instance, Sen. Cory Gardner, R-Colo., has held up Justice Department nominees over differences with the Trump administration on marijuana policy. Finally, Trump himself shares the blame for the slimmed down federal workforce. The Partnership for Public Service, which tracks political appointees, has noted that more than 160 key positions out of nearly 700 don’t have nominees. And some of the delay is the result of legitimate concerns about Trump nominee qualifications and conflicts of interest, which in some cases have prompted heightened scrutiny and dragged out the process. We also checked one statement by West Virginia Gov. Jim Justice, who Trump called to the stage to address the crowd. This fits with recent polls. If anything, Morrisey is more than a little behind. The most recent poll, taken in July by the Trafalgar Group, a Republican firm, found Manchin leading Morrisey 50 percent to 40 percent. A poll in June, by the nonpartisan survey outfit from Monmouth University, found Manchin ahead, 50 percent to 43 percent. This story was originally published by Politifact. Thursday’s primaries in Tennessee concluded the 2018 primary season for the 13 Appalachian states getting ready for midterm elections on November 6. Tennesseans selected candidates for each of the state’s nine congressional districts, as well as candidates for one U.S. Senate seat and the Governor, and others. Congressional Districts 1, 2 and 3 are comprised entirely of Appalachian counties. Districts 4 and 6 fall partially in the region, while District 7 is home to only two counties (Lawrence and Lewis) that are considered by the Appalachian Regional Commission as part of Appalachia. The Senate race on November 6 will be held over the seat currently occupied by a Republican Senator of 11 years, Bob Corkerr, who announced earlier this year that he would not be seeking reelection, opening the field for Republican candidates. Race for that Senate seat will be one of the most closely watched in the nation come November, as Democrats seek an upset in traditionally Republican stronghold states. Corker’s party put forth four candidates, and U.S. Representative Marsha Blackburn won with almost 85 percent of the votes. Democrats picked between Billy Bailey and Phil Bredesen, with the latter winning the party nomination. All of the six Appalachian Congressional Districts in Tennessee are in firm Republican grip, but in the case of Districts 2, 6 and 7, GOP incumbents decided not to seek reelection. Marsha Blackburn, currently representing District 7, decided to fight for Bob Corker’s vacated seat in the Senate. On the GOP side, the District 1 primary went to the Incumbent Phil Roe, and District 2–with its crowded field of 7 candidates–went with Tim Burchett, the Mayor of Knox County.Incumbents took the Republican nominations in District 3 and District 4, where the nomination went to Chuck Fleischmann and Scott DesJarlais, respectively. District 6 saw four candidates, with businessman John Rose winning the nomination. District 7 will have the State Senator, Mark Green, running for the Congress seat. He ran uncontested in that District. Martin Olsen was the only Democratic candidate in District 1, as was Danielle Mitchell in District 3. Out of the two candidates running in District 2, Renee Hoyos took the nomination, winning over 70 percent of the votes. Mariah Phillips will fight for the District 4 seat in November and so will Dawn Barlow in District 6. Justin Kanew won the primary in District 7. Governor’s race will be another one of the closely anticipated attempts to undermine the Republican supremacy in Tennessee. According to Vox, the gubernatorial race has already cost over $50 million. Democrats picked former Nashville Mayor Karl Dean. He will face off with Bill Lee, a businessman from south of Nashville. While all Republican candidates ran campaigns heavily aligned with the “Trump agenda,” Vice President Mike Pence’s endorsement of Diane Black was not enough to push the favored candidate over the finish line. November 6 should be a great litmus test of President’s popularity among Tennesseans. Georgia held its primary runoff on Tuesday (July 24), completing its list of candidates on both sides of the aisle for the November 6 midterms. Brian Kemp, the current secretary of state of Georgia, won the GOP Governor nomination with almost 70 percent of the votes. Democrats picked their candidates for the U.S. House Districts 6 and 7, where Lucy McBath and Carolyn Bourdeaux took the party nominations respectively. They are joining growing ranks of female candidates selected for the midterm races – an election battle of great importance to the Democrats, who are currently a minority in both the House and Senate. Next in line are primaries in Tennessee on August 2. Primary season for the Appalachian states is slowly coming to an end. Two more states, New York and Maryland, held their primary races on Tuesday, leaving Tennessee as the last remaining of the lucky thirteen. Both New York and Maryland are marginally represented in Appalachia in terms of the number of counties being part of the region. New York’s Appalachian southern tier represents three congressional Districts (19, 22 and 23), while Maryland’s northwestern tip is fully contained within the 6th District. You can see official Appalachian Regional Commission’s map of Appalachian counties here. On November 6, New Yorkers will vote for members of the U.S. House, Senate, as well as for their governor and lieutenant governor. In all three Appalachian districts of New York the GOP is currently in power. The Republican incumbents–John Faso in District 19, Claudia Tenney in District 22 and Tom Reed in District 23– all ran unopposed. The Democratic field was a little more crowded. Out of seven candidates in District 19 Antonio Delgado took the nomination by a margin of four percent. District 22 saw one uncontested Democratic candidate, Anthony Brindisi, a state assemblyman representing District 119. In District 23, Democrats had five candidates to choose. Max Della Pia and Tracy Mitrano got 32.4 and 32.3 percent of the vote, respectively. As of press time, the winner has not been called yet. New Yorkers also picked their candidates for the November 6 U.S. Senate midterms, but in these districts, the primaries were largely symbolic. Current Democratic incumbent, Kirsten Gillibrand, will face the GOP’s Chele Farley, who ran unopposed. Farley is a New York Republican operative with background in the finance industry and with Wall Street giants like Goldman Sachs. New York’s closed primaries for the state’s governor and lieutenant governor will take place on September 13. Political commentators have widely speculated that the upset in District 14, where Democratic incumbent Joseph Crowley lost the primary to 28 years old newcomer Alexandria Ocasio-Cortez could be an indicator of a generational groundswell that could challenge Gov. Cuomo’s position. The primary race for New York governor this fall will see the actress Cynthia Nixon and Greg Waltman as Cuomo’s challengers. Maryland’s District 6 field was crowded and interesting on both sides of the aisle. The Democratic incumbent, John Delaney, did not run in the primaries, as he focuses on his bid for the White House in 2020. Delaney’s decision not to run left the doors open for eight other Democratic candidates. David Trone won the Tuesday’s primaries with 40.4 percent of the votes. Meanwhile, the GOP had four candidates, with Amie Hoeber emerging victorious. Maryland is another state in which a crucial Senate general election will take place on November 6, a race that will prove to be particularly important for the Democrats as they try to regain control of the Senate and defend the seats they already have. Maryland, however, is considered a safe blue state. The last time the state saw a Republican Senator was in 1987. Democratic incumbent Senator, Ben Cardin, faced seven opponents and won with 80.4 percent of the votes. The second place went to Chelsea Manning, with 5.7 percent. The GOP field was packed with the total of 11 candidates, where Tony Campbell took the nomination. Last but not least, Maryland also held its primaries for the state’s governor. The GOP’s incumbent, Larry Hogan, ran unopposed, while Democrats chose from among eight candidates. Ben Jealous won the race with comfortable lead of over 10 percent over his closest opponent, getting the total of 39.8 percent of the votes. Two Appalachian states that already held primaries (see all the primary races recaps below) held runoff races on Tuesday as well. Henry McMaster won a GOP nomination for the South Carolina’s Governor with 53.6 percent of the votes, defeating John Warren. In Districts 2,4 and 7 Sean Carrigan, Brandon Brown and Robert Williams won the nominations on the Democratic side. William Timmons was the winner of the GOP runoff race in South Carolina’s District 4. In Mississippi David Baria faced Howard Sherman in a runoff race for the Democratic nomination for the U.S. Senate. Baria won with 58.5 percent of the votes. On the GOP side Michael Guest defeated Whit Hughes and will be the candidate for the Congressional seat representing District 3. 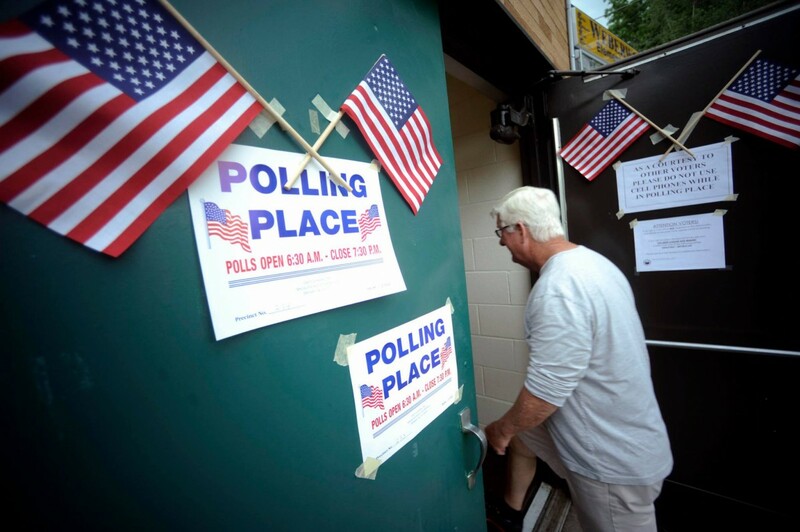 Two more Appalachian states held their primaries on Tuesday (June 12). Voters in Virginia picked candidates to run for one of the state’s US Senate seats and all 11 Congressional Districts. South Carolinians picked candidates to run for their seven Congressional Districts, the governor and several other public offices. Democratic Incumbent and Hillary Clinton’s presidential running mate Tim Kaine secured his spot on the ballot running uncontested. GOP voters picked Corey Stewart, a Prince William County supervisor. The format of the midterm elections for several of the Congressional Districts was a little different in Virginia than in other states, with both parties holding conventions to select their candidates for the District 5, and the GOP holding conventions for Districts 6, 7 and 8. Results for these Districts are not yet available. In Districts 1 and 9 GOP incumbents Rob Wittman and Morgan Griffith ran unopposed. The Republican Incumbent from District 2, Scott Taylor, secured a comfortable win over Mary Jones, winning with 75.9 percent of the votes. The GOP did not file a candidate in District 3. Ryan McAdams took the nomination with over 72 percent of the ballots in District 4. District 10 Incumbent, Barbara Comstock, defeated Shak Hill, while Jeff Dove ran uncontested in District 11. In Districts 3, 4, 8 and 11, Democratic Incumbents Robert C. Scott, A. Donald McEachin, Don Beyer and Gerald E. Connolly respectively, ran unopposed. Districts 1, 2, 6, 7 and 10 all saw female candidates securing nominations. Vangie Williams, Elaine Luria, Jennifer Lewis, Abigail Spanberger and Jennifer Wexton will seek to win the House seats on November 6 for the Democrats for their respective Districts. District 9 went to Anthony Flaccavento who ran away with the nomination, securing over 78 percent of the votes. Come November 6, South Carolinians will choose their next governor. Democrats picked James Smith as their candidate, while on the GOP side the Incumbent Henry McMaster failed to secure over 50 percent of the votes, forcing a runoff race with John Warren. Runoff races in South Carolina will take place on June 26. In Districts 2, 3, 5 and 6 the GOP Incumbents ran unopposed. Joe Wilson, Jeff Duncan, Ralf Norman and Gerhard Gressman respectively secured their spots in the November general election. Incumbent in District 7, Tom Rice, secured a comfortable victory, with over 83 percent of the votes, over Larry Hammond. District 1 was probably the biggest surprise of the entire GOP primary. Incumbent Mark Sanford lost to Katie Arrington by almost four percent of the votes. Sanford, who openly spoke against President Trump seems to have paid the political price. Arrington was endorsed by the President in the hours before the closing of the polls. District 4 will hold a GOP runoff race with Lee Bright as one of the candidates. As of press time the second candidate was not yet announced, as the votes are still being counted in a close race between the next two candidates. On the Democratic side, the only Incumbent, James E. Clyburn in District 6, ran unopposed. District 1 picked Joe Cunningham, District 3 Mary Geren and District 5 Archie Parnell. Districts 2, 4 and 7 will see runoff races. Annabelle Robertson will face Sean Carrigan, Doris Turner will run against Brandon Brown and Robert Williams against Mal Hyman, respectively. Next in line are primaries in New York and Maryland on June 26. Mississippi and Alabama, two of the southernmost Appalachian states, held their primaries on Tuesday, June 5. The state of Mississippi will elect one of its Senators in the general election on November 6 and the second one in a special election. GOP voters picked the incumbent, Sen. Roger Wicker, over Richard Boyanton, a small business owner and anti-establishment candidate who openly rejected donations and assistance from the Republican party, to run in the regular race. Mississippi holds a nonpartisan special Senate election, also in November, in which voters will pick a replacement Senator for the Republican Thad Cochran, who retired from the US Senate due to health issues. The Democratic field in the Senate primaries for the state looked significantly broader, with six candidates running. David Baria, State House minority leader, will face Howard Sherman in the runoffs. Three out of the four Congressional districts of Mississippi are currently in GOP hands. Out of the three incumbents, only two — Trent Kelly in District 1 and Steven Palazzo in District 4 — ran in the primaries, leaving District 3 entirely to the new candidates. Incumbent Trent Kelly ran unopposed in District 1, while Steven Palazzo won his race in District 4 against his only opponent E. Brian Rose. Democrat Bennie Thompson is the incumbent in the District 2 and ran unopposed in his party primary. The GOP didn’t file a candidate. District 3 saw a competitive race on the GOP side, with six candidates. Michael Guest and Whit Hughes will go against each other in the runoffs. Democrats presented a two-candidate field, with State Representative Michael Evans, winning the nomination. Alabama picked candidates for all of it’s seven Congressional Districts, as well as for governor and several other public offices, including the state’s Supreme Court. The GOP incumbent Governor, Kay Ivey, faced three other candidates (Michael McAllister, fifth name on the ballot, passed away in April) and took the nomination with 56 percent of the votes. But the Democratic field was even more crowded. Out of six candidates, the voters picked Walter Maddox, Mayor of Tuscaloosa, to represent their party. He won with 53 percent of the votes over Sue Bell Cobb, the former chief justice of the Alabama Supreme Court, among others. Of the seven Districts, the GOP has control over six of them. In Districts 1, 3 and 6 GOP incumbents, Bradley Byrne, Mike Rogers and Gary Palmer respectively, are unopposed. In District 2, the incumbent Martha Roby will face off with Bobby Bright, former Democratic U.S. Representative, now a Republican. District 4 and 5 each had two GOP candidates. Robert Aderholt, the incumbent, won District 4 with overwhelming 81.5 percent of the votes, while District 5 also went to the incumbent, Mo Brooks, who won over Clayton Hinchman by margin of over 22 percent of the votes. The GOP didn’t have a candidate in the District 7, where the Democratic Incumbent, Terri Sewell, ran unopposed. Districts 1, 2, 3 and 4 had two Democratic candidates each, while in District 5 Peter Joffrion ran uncontested after Butler Cain dropped out of the race in February. District 6 saw Danner Kline also run uncontested. Robert Kennedy, Tabitha Isner, Mallory Hagan and Lee Auman won Districts 1, 2, 3 and 4, respectively in the Democratic primaries. Kentuckians were next in line to cast their ballots in Tuesday’s (May 22) primaries. All six Congressional districts were up for grabs and both parties had candidates running in all of them. GOP politicians currently fill five of the Congressional seats. Rep. John Yarmuth is the only Democratic Incumbent who will be defending his seat on November 6. He was uncontested in yesterday’s primaries. On the other side of the aisle, districts 1,2 and 4 also saw uncontested incumbents, with James Comer, Brett Guthrie and Thomas Massie respectively getting ready to defend their seats in November general elections. In the third District, the GOP voters chose Vickie Yates Glisson to run against John Yarmuth. Glisson has experience in public service as secretary of the Kentucky Cabinet for Health and Family Services. She was appointed to the post in 2015 by Governor Matt Bevin. District 5 incumbent, the “Prince of Pork” Hal Rogers won against Gerardo Serrano by a landslide, getting 84 percent of the votes. Rogers earned his nickname by bringing a lot of controversial investments to his District, like prisons, with another one on the horizon to be the most expensive prison built in the history of the United States. Yet, some of the counties he represents remain consistently among the poorest in the country. He’s been in office as the fifth District’s Representative since 1981. In District 6, the GOP incumbent Andy Barr faced off with Chuck Eddy and won with almost 84 percent of the votes. He will face Amy McGrath, a marine fighter jet veteran, who defeated Lexington’s Mayor, Jim Gray, and State Senator Reggie Thomas. In Georgia, voters picked candidates for all 14 Congressional Districts, State Legislature, the Governor and several other public offices. In Appalachian Congressional 3, 6, 7, 9, 10, 11, and 14 districts all GOP candidates were incumbents, and won their respective races. In District 13 Incumbent David Scott run uncontested on the Democratic side. In the third District, Drew Ferguson defeated Philip Singleton with an overwhelming 74.4 percent of the votes. District 10 went to Jody B. Hice who defeated two other opponents with almost 79 percent of the votes. Karen Handel and Robert Woodall won GOP primaries in District 6 and 7, respectively. Handel run uncontested, while Woodall won easily, getting almost 72 percent of the votes. Lucy McBath and Kevin Abel in District 6 and Carolyn Bordeaux and David Kim in District 7 qualified for the runoffs in the Democratic races. Districts 9 and 11 saw republicans Doug Collins and Barry Loudermilk take the nominations after uncontested races. Democrats will see Chuck Enderlin running as the third District candidate, Josh Mccall in the District 9, Tabitha Johnson-Green in District 10, Flynn Brody in District 11, David Scot and Steven Foster in District 14. Brody and Foster run uncontested. In the Governor’s race primaries the Democrats elected Stacey Abrams to be the candidate in November, while on the GOP side Casey Cagle will face off with Brian Kemp in June 24 runoff. Abrams is the first African American major party nominee for Governor in the history of the United States. Pennsylvania’s Tuesday primaries were another highly anticipated, bellwether political event this year, ahead of the November 6 midterm elections. Republicans’ hopes were somewhat restored on Tuesday following a blow during the March special elections in Pennsylvania’s 17th District, where Democrat Conor Lamb defeated Rick Saccone. The majority of the GOP winners this week were endorsed, strong pro-Trump candidates. Rick Saccone took a second shot at elections, taking on the State Senator Guy Reschenthaler in the redrawn 14th District. Saccone repeated his March failure and lost to favored Reschenthaler by over 10 percent of the votes. In the Senate primaries, the Democrat Bob Casey Jr. ran unopposed, while on the Republican side, Lou Barletta won the race against Jim Christiana, securing a victory with 63 percent of the votes. Barletta was endorsed early on by the President Trump, who, soon after the results were called, congratulated him on twitter. Democratic Governor, Tim Wolf will face off with Scott Wagner after defeating two opponents, Paul Mango and Laura Ellsworth by comfortable margins of around 7.5 and 25.5 percent respectively. Another fact that made the Pennsylvania’s primary stand out this year was a number of female candidates running–and winning–across all 18 districts. In the 11 Appalachian districts three of the winners were female, while in all 18 districts, 8 women won their races. The current 115th Congress’ Pennsylvania caucus is all male. Next in line are primaries in Georgia and Kentucky on May 22. This Tuesday (May 8, 2018) brought the first wave of primary elections before the House and Senate midterm elections on November 6. Some of the highest profile races that grasped the attention of the national media took place in Appalachia: West Virginia, Ohio and North Carolina. Among the most anticipated and scrutinized races was the GOP Senate primary in West Virginia, where two mainstream Republican politicians, Patrick Morrisey (West Virginia Attorney General) and Evan Jenkins (Congressman from West Virginia’s 3rd Congressional District) faced off with an outsider, ex-coal baron and Massey Energy CEO, Don Blankenship, best known for serving a year in prison for his involvement in a tragic mining incident that left 29 miners killed. Patrick Morrisey won the race, taking 35% of the votes. Jenkins came in second with 29% and Blankenship third with just under 20%. In a rare instance of a top-to-bottom party unity, the entire GOP establishment came together to denounce Blankenship and urged West Virginia voters to reject the controversial candidate, whom President Trump portrayed as unable to defeat the Democratic incumbent, Sen. Joe Manchin III. Manchin won his party’s primary with an overwhelming 70% percent of the votes, defeating challenger Paula Jean Swearengin. The Democratic Primary race for the West Virginia’s U.S. House District 3 was another highly anticipated race, where an unorthodox candidate, Richard Ojeda pulled off a landslide victory over his opponents, with over 50% of the votes. He will face Carol Miller, the winner of a much tighter GOP primary. Richard Ojeda, a US Army veteran and a member of the West Virginia Senate, is an unconventional Democrat, whom many point out as the kind of candidate that the Democratic party might need to win back at least some of the West Virginia seats. Most notably, Ojeda can boast the support of worker unions. Recently, he has shown support for West Virginia teachers striking across the state. In West Virginia U.S. House Districts 1 and 2, the Democratic primaries were won by Kendra Fershee and Talley Sergent respectively. They will face GOP incumbents, David B. McKinley and Alex X. Mooney. In Ohio, a number of consequential primary races took place last night. Richard Cordray celebrated a comfortable win over Dennis Kucinich in the Democratic Senate primary, earning over 60% of the votes to Kucinich’s 20%. Cordray, the first director of the Consumer Financial Protection Bureau, will face Republican Mike DeWine, Ohio’s Attorney General and a former U.S. Senator. DeWine defeated Mary Taylor with an almost 20% lead. GOP voters had a chance to vote for their candidate to the U.S. Senate and picked Rep. Jim Renacci (R-OH 16). He will run against the Democratic incumbent, Sen. Sherrod Brown. It was Brown who unseated current GOP’s governor candidate Mike DeWine in 2007. Renacci was endorsed by President Trump and will be at the frontlines of a contest over what is perceived as part of a lost Democratic territory. Ohioans voted for candidates in all 16 U.S. House Districts. Here are the detailed results compiled by the New York Times. Ohio voters also voted in support of Issue 1, a bipartisan proposal to change the rules for redistricting in Ohio. The bipartisan proposal is an attempt to fix the process, which has a long and scandalous history in the state. It was approved with an overwhelming support of almost 75% of the votes. In North Carolina voters picked candidates for all 13 U.S. House Districts. Some races, like District 1, had uncontested candidates on both sides of the aisle. Others, like District 2 Democratic primary, where Linda Coleman took the victory over Ken Romley, or District 9 GOP race, where Mark Harris narrowly defeated the incumbent Robert Pittenger, turned out to be slightly more competitive. Nick Freitas, a controversial candidate with documented past of connections to white nationalists, won the nomination with less than 2 percent advantage over a member of the Virginia House, 44.9 to 43.1 percent respectively. The third GOP candidate, E.W. Jackson, secured a low 12 percent.